While they study vastly different fields, Diane Adams and Michael Richter have two things in common. They are among the most promising young scientists in the United States, and they are both recent recipients of one of BSF’s most prestigious honors, the Bergmann Memorial Award. Diane Adams of Rutgers University and Michael Richter, a visiting economics professor at the University of Pennsylvania, with their Bergmann Award certificates, which were presented at BSF’s February 2016 Israeli Embassy reception in Washington D.C.
Named in memory of Professor E.D. Bergmann, who played a leading role in establishing the BSF, the award is presented to young scientists and researchers who are recipients of new BSF grants, judged on the quality of their proposals. Adams, a marine biologist, is studying how corals are adapting (or in some cases, not adapting) to rising acidity in our oceans. 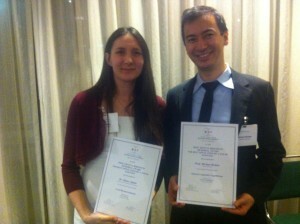 Her scientific partner, Dr. Tali Mass was also honored this year with a Bergmann Award as part of the project. Richter, an economist, is expanding the study of one of his field’s most fundamental concepts – competitive equilibrium – to see if its tools can be used effectively in other areas. Adams and Richter were both on hand at BSF’s recent reception at the Israeli Embassy in Washington, where they were honored for their achievements. Each will receive a grant that will allow them to advance and continue their research. Bergmann Award winner Dr. Tali Mass, of the University of Haifa. Adams, an assistant professor at Rutgers University’s Department of Marine and Coastal Sciences, is currently working with Dr. Tali Mass,of the University of Haifa’s Leon H. Charney School of Marine Sciences, on a project that studies how corals calcify (or form hard skeletons necessary for maintaining marine life) in the face of ocean acidification, one the most certain environmental factors that will change in the coming decades of the 21st century. Ocean acidification occurs when oceans absorb increasing amounts of carbon dioxide. This causes seawater to become more acidic, and reduces the amount of carbonate ions, which are important building blocks for coral skeletons. These skeletons are the basis for reef formation in shallow ocean waters, and are critical for the sustaining diversity of fauna found in those environments. Adams will use part of her grant money to travel to Israel for extensive study of coral skeletons in the Red Sea, an area known for its shallow shelves and marine life, as well as corals and in the Mediterranean. Mass said she is honored to be a co-recipient of the Bergmann Award, and to be working with Adams. 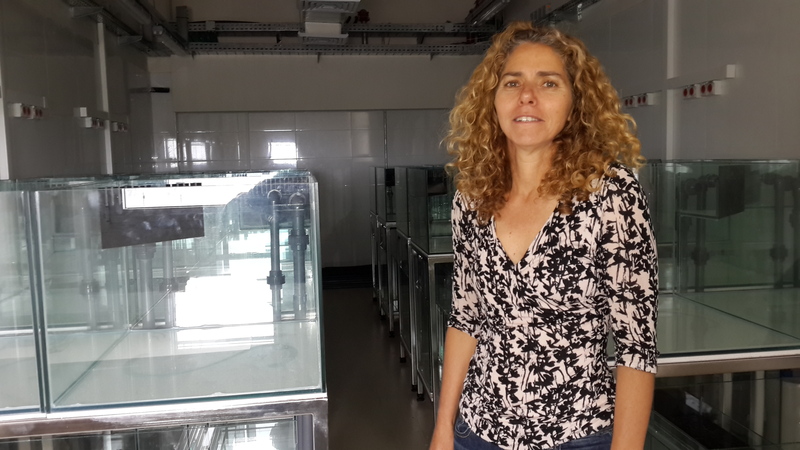 She said that when Adams visits Israel, she is looking forward to introducing her to Israel and its people, and to the University of Haifa’s unique study site, which includes a state-of-the art aquarium that is ideal for the types of corals they are both examining. “Both of us are pushing this challenge forward in our own labs, and during Diane’s visit, we plan to join forces in the hopes of achieving our goal,” Mass said. Adams was initially trained in marine biology by her parents, along the beaches and tide pools of Southern California, and then more formally at the University of California, Santa Barbara. She received her doctorate from the MIT/Woods Hole Oceanographic Institution. One of the goals is to gain a better understanding of corals that can resist ocean acidification, as well as corals that are in danger of succumbing to ocean acidification. 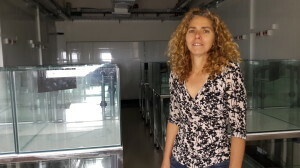 At Rutgers, she has her own lab, where she studies corals and other marine life. As part of her current project, she will compare coral from the more tropical Red Sea and Hawaii with those from colder water temperatures, such as coral found off the New Jersey coast and the Mediterrenean. “By comparing gene expression and function across sub-tropical, tropic, and temperate corals, we hope to identify whether specific proteins have key, conserved roles. Therefore, the proposed research will contribute novel scientific and technical advancements that will open new avenues of research in fundamental coral biology,” Adams said. Richter, a visiting economics professor at the University of Pennsylvania, works with Ariel Rubinstein, a Tel Aviv University economics professor who specializes in economic theory. Their project is influenced by the concept of competitive equilibrium, and how variations of that theory can apply to different markets. In economic terms, competitive equilibrium occurs when there’s interaction between profit-minded producers and product-minded consumers in competitive markets with freely determined prices. This gives rise to an equilibrium price, where the quantity supplied is equal to the quantity demanded. In the standard economic framework, harmony is achieved through a price system that assigns prices to each good, and agents may then buy and sell these goods at those given prices. But there are many settings where the welfare properties of market equilibria are not known. By expanding the definition of competitive equilibrium, Richter and his coauthor expand this welfare analysis to find new situations in which market-like equilibria perform well, situations where they do not, and find the precise boundary between these two situations. Such situations include indivisible goods (such as houses and cars) and settings where matching occurs, such as the marriage market, or the assignment of recently graduated medical students to hospitals. “In our work, we apply our equilibrium concept to a variety of convex economies to analyze their efficiency properties,” Richter said. Richter was thrilled to find out that he won the Bergmann Award, both personally and for his field of research. While there are still many people who don’t consider economics as part of the science world, Richter wants to help change that perception. On a personal level, he said that winning the award means a lot to him. “It’s a sign of faith in my work as a young researcher,” he said.